At the very least, Logan Lucky is in on the joke. A group of thieves — played by the likes of Channing Tatum, Adam Driver and Daniel Craig — have just colluded to rob a high-profile NASCAR race in North Carolina. A truck is recovered in a parking lot. As the public and media get wind of the heist, a TV newscaster dubs it, “Ocean’s 7-11.” Yes! In fact, the crime could have used a big gulp of originality. Tatum is Jimmy Logan, a blue-collar, John Denver-lovin’ construction worker. Movie title aside, he isn’t lucky at all. Same goes for his West Virginia family. Jimmy’s football career was cut short by a leg injury. His marriage failed and now his ex-wife (hey, Katie Holmes) has custody of his cute-as-a-button daughter. His brother Clyde (Driver) lost the lower part of his arm serving in Iraq and now serves drinks at a dive bar. Their hairstylist sister Mellie (Riley Keough) has done OK for herself, but there’s still time. Jimmy wants to turn the family’s fortunes in the right direction, and it has nothing to do with buying lottery tickets. His plan: Pull off an elaborate robbery of the Charlotte Motor Speedway in North Carolina, home of a big ole’ NASCAR race and a cash-flow operation in which the money gets funneled through an underground network of tubes. Jimmy thinks he knows how to go on, take the money and run. Anyone who has seen an Ocean’s movie knows what comes next: Recruiting the rest of the rag-tag crew. First up is Craig’s Joe Bang, an unlikely demolitions and chemistry expert who needs to be sprung out of jail to do the job. (Craig is nearly unrecognizable in a dyed blonde buzz cut and tattooed body and speaking in an Appalachian dialect.) Joe’s dimwitted brothers, played by Jack Quaid and Brian Gleeson, take the Casey Affleck and Scott Caan roles. The super-cool Keough is a welcome step up from Julia Roberts, who never did seem comfortable as the lone Ocean-ette. The group is easy enough to root for, despite some vague Southerners-are-dumb-lugs stereotyping. Tatum is so appealing that he can pull off the best heist of all: Playing a Southern-fried version of George Clooney’s Danny Ocean to perfection. But the group’s ultra-laid-back personalities translate into a sluggishness that pervades the entire film. The script (co-written with Rebecca Blunt, apparently a pseudonym) is a bit jangly and never quite finds a steady rhythm. One set piece involving the inmates fighting at Joe Bang’s jail weighs down the narrative. Even the all-star cast is bloated: Seth MacFarlane as a British energy-drink mogul sponsoring a car at the race is pure buffoonery. And Hilary Swank’s hard-nosed investigator onto the Logans’ scheme is acting in an entirely different movie. She’s also a buzzkill. Everyone is having a blast here, especially Craig. I wish I could have just let the good times roll. 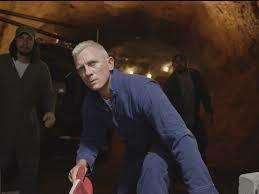 But in car-speak, Logan Lucky is kinda like the rusty orange Dodge Charger in The Dukes of Hazzard — it gets from Point A to B while making a lot of noise. Sometimes you’d rather ride in a smooth Mercedes-Benz S-Class. You have got to be a liberal!!!!! Independent! I don’t grade movies based on politics, btw. 34 good reviews and counting!!!!!!! I’m glad! I have tremendous respect for Soderbergh. I just wanted a new song, not his greatest hits.